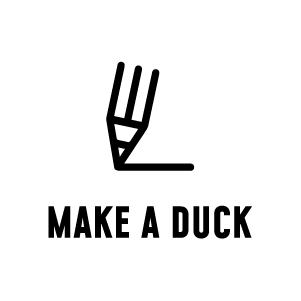 Make a Duck. Give a Duck. Share a Duck. Meetups are designed for groups of people to spend time together, have fun, make personal connections, share stories in casual settings, and put pen to message cards writing positive messages. Meetups can be anywhere... at public libraries, schools, breweries, universities, senior centers, civic gatherings, the list goes on. Want to have a meetup? Contact us! At a meetup, participants craft hand-written messages. The messages are simple words of encouragement for anyone and everyone. Make the messages for a friend, a stranger you may encounter this week, or the guy that makes you coffee at the coffee shop! Check some out here. The written messages get embellished with a variety of duck “gifts”: lapel pins, stickers, decals, and other objects provided by Troy Gives A Duck. Attendees leave with a handful of duck gifts with messages. They also leave behind additional messages for Troy to distribute on his own. Meetup participants (“Duckers”) deliver their duck gift messages to friends, neighbors, family, and strangers – anyone who could use a smile, a bit of kindness, or words of encouragement. Troy will collect some of the messages created at the meetups for himself… so he can either spontaneously hand out the duck gifts with messages while at the library or City Flea or a public park. He also plans to set up planned events where people can meet him there to receive some duck kindness! To keep the conversation and encouragement going, anyone who received a bit of duck kindness can share on their social media. This may mean sharing where they keep the duck, who gave them the duck, or how they felt when they got it. Likewise, those giving ducks can share their giving experience on their social media. We use #WhoGivesADuck and #IGiveADuck on all of our platforms, under @TroyGivesADuck, and invite all to use them as well! can't make a meetup? diy.